Replacement Zenport H-Strap Leather Harvest Strap for Fruit Clippers and Harvest Shears. A leather strap helps minimize your clippers slipping out of your hand. Universally replaces leather strap for fruit clippers and shears. Just remove the spring and fit the holes over the spring posts and reattach the spring. Very easy and simple installation. Constructed of high quality leather. The Zenport H322 Small and H320L Large citrus stem clippers are constructed of forged stainless steel are ideal for harvesting large quantities of oranges, apples and other fruits. The short clipper blades allow for extra leverage when clipping tough stems. Spring loaded action automatically opens blades after each cut. H320S measures 4.5-inches overall length. H320L measures 5-inches overall length. Commercial growers use clippers such as Zenport H320S and H320L with picking bags to catch the fruit. The bags cushion the fruits and keep them from bruising. Pulling the fruits from stems can leave holes in the fruit skin and making the fruits vulnerable to rot. 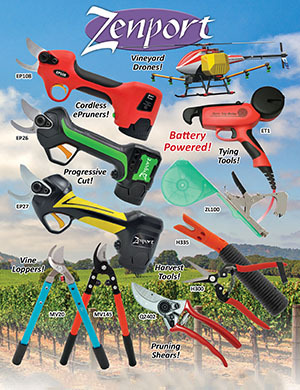 The commercial growers harvest the fruit close to fruit tops using the hand clippers. Fruit quality plays an increasingly important role in the competitive marketplace and therefore requires critical attention. Growers and marketers have always associated fruit quality with clip harvesting to provide high quality fruits. The clipping motion is such that the blade fits into the stem close to the fruit skin, cutting the stem off as close to the fruit as possible without damage to the fruit. Leather straps attached to the clipper allows the picker to attach the tool to his finger instead of putting the clipper down after each use.